Innovation continues to define both Standard and Modern as we roll on through one of the best constructed seasons in the last decade. Winners at notable major tournaments this past weekend define our big movers this week, as the community looks forward to Dragons of Tarkir spoilers in just a few short weeks. Green was already the default best color in standard before Fate Reforged rolled up and dropped this sweet threat onto the table. Though many were dubious at first, recent showings at big standard tournaments has demonstrated that Whisperwood Elemental is an excellent way to close out games fast if your opponent isn’t packing enough removal. In partnership with Nykthos, Shrine to Nyx, and various mana dorks, this heavy hitter provides especially tricky scenarios for both aggro and control decks who will often have trouble going just one for one with the lord of the groves. With FRF not likely to be as opened as many other sets, there’s a good chance that this one falls off a bit heading into summer, only to rise again at rotation. As such you can sell now if you got in early and don’t need them to play with. Otherwise, you’re safe to hold into fall. Prices on this most wondrous of mana generators range anywhere from $5 to $8 at present, with scant few copies available anywhere in the $3-4 range it was trading at just a few weeks back. 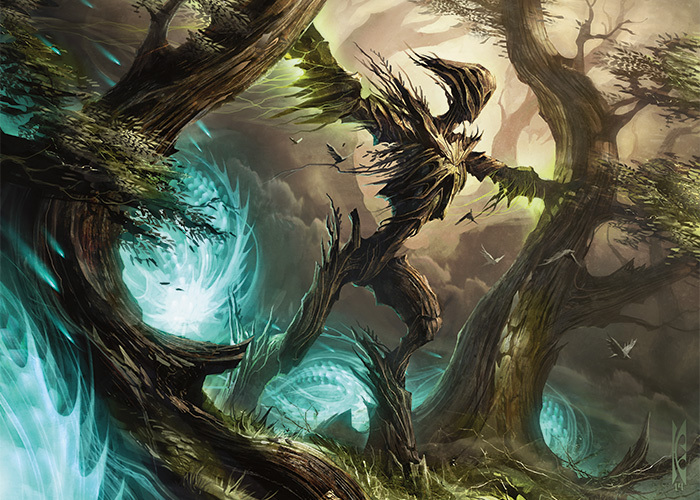 Blame the rediscovery of mono-green and green-X devotion builds, within which Nykthos is often the glue that binds the deck together, powering out Temur Sabertooth, Whisperwood Elemental and Hornet Queens with equal finesse. I’ve been a buyer thus far on any copies I could find under $4, but your best entry point may now be at rotation, where you should be able to scoop copies up and sit on them for a few years to double up. The other deck that is doing exceptionally well right now is R/W aggro, but in truth, getting a free card per turn for the low low cost of just 3R is likely to appeal to many decks over the next year. Heck, we use to pay 4 a turn for this effect! With constant play, this card could easily rise into the $6-8 range next fall, so if you can score some under $4, it seems like a reasonable bet on card advantage continuing to be worth of a few card slots for the rest of the year. I’ve been holding some of these since they first came out, but they never really got there as a spec, so those 3 playsets will be finding homes in my trade binder and various casual decks once I’m done with them in Standard. The card is great, and there is some version of the future where it might even catch fire in Modern with Nykthos to power it out and do something ugly, but I wouldn’t be caught holding my breath on that, or very many of these at rotation either. It’s hard to believe that I was picking these up last year at $6 as an EDH spec, and now here we are with Amulet Bloom earning Tier 1 respect in Modern and this card ensuring it has enough consistency in comboing off to make those bones. There is a solid chance this single print rare shows up in Modern Masters 2 this summer, so it’s probably time to claim whatever profits you can and look to pick some up on the cheap when MM2 prices bottom out in July. This is a great card in EDH/Casual environments, and cool factor has kept it up, but the threat of a reprint in MM2 is just too great for it to not recede into fearful territory. You should be unloading these. This card’s been on a bit of a roller coaster lately with it’s price tightly tied to how well GBx Reanimation strategies are doing at big Standard tournaments. It will likely oscillate in the $3-6 range heading toward rotation, but you don’t want to be caught holding too many because this will be a low demand casual card come the fall. There’s also a fresh printing in the Clash Pack for the spring, which hardly helps. Given that this key card from the Amulet Bloom deck has been on the rise of late, I wouldn’t give this minor pullback much thought. Having just been printed in the last Modern Masters set, it’s pretty unlikely to see yet another reprint in MM2 this summer, so you are likely safe to snag these in the $12-14 range or in trades where you can, hoping it will rise into the $20 zone on the back of one deck or another. Good day I got the following Magic Cards that I want to sell. Can you please previde me with a selling price. ^ is the guy above there serious? Otherwise I think those cards don’t cost anything. Mishra’s Bauble is worth something. That’s it.